Shaklee just released the results of a new independent Vivix study conducted with a team of scientists at the State University of New York at Buffalo. The goal of this rigorous study was to determine the effects of Vivix on Nrf2, described by Dr. Carsten Smidt as, “the mother of all anti-aging genetic regulators.” Nrf2 activates the body’s detoxification processes, mobilizes antioxidant defenses, triggers anti-stress activity, and strengthens immune balance. Healthy adults were asked to consume a 910-calorie typical fast food breakfast loaded with saturated and trans fat, carbohydrates, and a little bit of protein. Then the scientific team measured the impact of the meal on Nrf2 activity. With the “food only” group, Nrf2 activity was totally flat to declining over five hours. But the same meal eaten with a serving of Vivix created a massive spike of Nrf2 activity within the first three hours, with a significantly elevated protective level maintained after five hours. What does this mean? As we age, Nrf2 stops responding when we ingest a high-fat, fast food meal. As a result, such a meal can dramatically increase cellular aging. The great news is... no matter what diet you eat, Vivix triggers Nrf2 anyway! 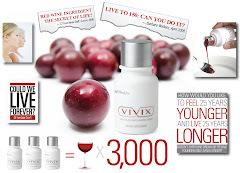 The better your diet and lifestyle, the better Vivix will work to slow down the aging process!